What Material for the bay? 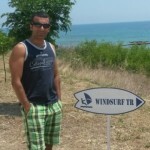 Windsurf TR Rüzgar Sörfü Okulu ve Malzemeleri › Forum › 2. El Windsurf Malzemeleri › What Material for the bay? Bu başlık 1 cevap ve 2 kişi içeriyor, son güncelleme hakan hoca tarafından 9 ay, 3 hafta önce. I am looking at getting a second hand windsurf to get back in the sport, I need your help to identify what to get. I did a bit of windsurf 10/15 years ago before starting kitesurfing ( I was living in Mexico and there was no windsurf material available for rent there). I went back on a windsurf quickly during some holidays in 2012 to see that I could still do a few basic things (jibes, planning, no water start). From memory, I was using a Bic 150 liters with a 6.4m sail. pretty easy to use on flat water. I’m currently in Elwood but will relocate to Chelsea in october. I’m looking at something to use in the bay, more specifically in that part of the bay. The idea would be starting from the beach, take off and go play out back to cruse and work on jibes, ideally, I would be looking at spending something between $500-$800 so probably some equipment from early 2000’s When a student, I had a Bic veloce 75 liters. was too small for me. – what kind of board should I be targeting? any recommendation in terms of volume, width, weight? – what size and type of sail? I am likely to mainly sail in summer with southernly wind, the typical after 5Pm summer wind around 20 knots. You can try 130l board. 7.x sail. It also depends on your weight.